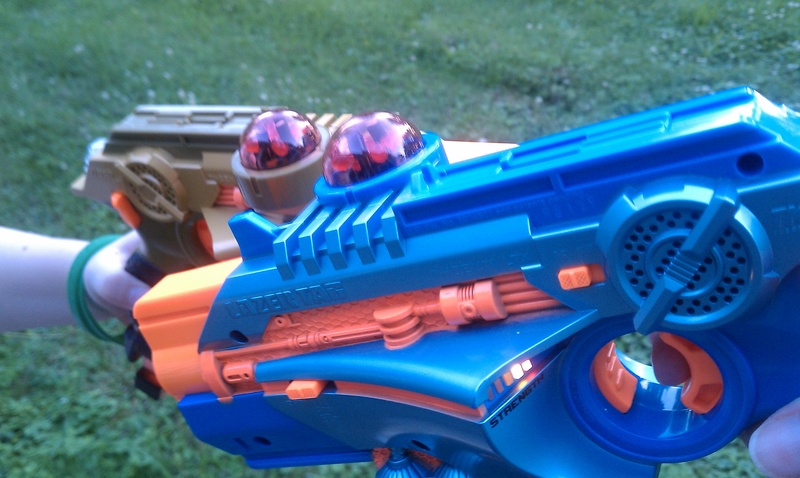 Review: Nerf, Part 3, Lazertag! Ever play Lazertag? It’s basically a game where you run around and target each other, with guns that are smart and can keep track of how many hits you‘ve taken (health) and shots you’ve fired (ammo). After so many hits, you’re “dead” and the other person wins. It’s good active fun, with lots of running, hiding, and sniping. Hasbro sells a Nerf branded, basic Lazertag System 2 Pack set that comes with 2 Phoenix LTX taggers (1 blue, 1 gold) and retails for around $50. This 2 player system is a relatively inexpensive introduction for your kids into the world of lazertag. Built in fire recoil – activated with every shot fired. Rumble pack – hit vibration lets you know when you’ve been hit. Manual reload – when you run out of your virtual ammo, you have to “reload”, which activates an integrated ammo clip, and you need to smack it back up into the handle of the tagger. Force field style shield – blocks hits for 10 seconds. and also has indicator lights for: ammo and strength (that’s your health/hits meter). The Lazertag System 2 Pack is designed for home use, but we take ours with us and play at playgrounds, and parks. You can also buy additional taggers for team battles; we only have 2 taggers, and will probably get 2 – 4 more, so more of our family can play in team battle mode (parents vs. kids?). Recommended for ages 8 – 15 years. I’m not sure a 6 year old would be able to understand the different lights and settings, or if they would just run around screaming. Very small kids would probably be more comfortable holding their taggers with 2 hands (which will help them be dropped less), while older kids and adults can easily use 1 hand. Also, these guns are electronic, so I would avoid dropping them as much as possible; I imagine they it’s not good for them to be smacked into things, or dropped. Be warned – be sure to pick up a big pack of AA batteries, as you’ll need 6 for each tagger. Some people take their lazertag very seriously, with tournaments and massive team battles, along with expensive equipment. Me? I just want a quick, fun, inexpensive game for the kids (who beat me every time – clearly I need more practice). Note: The Lazertag 2 pack system you can buy for $50 is just the basic 2 LTX taggers. For $300+ (on eBay and Amazon) you can get the Lazertag multiplayer system which, in addition to the 2 LTX taggers, includes 2 SHOT BLAST attachments, 2 Pinpoint Sight (green dot sight) targeting units, and 1 video game module. All in all, I’ve found that Nerf toys are a good investment – they last a long time, and get played with a lot. Unlike some toys that break quickly, or that get played with once and that’s it.